Stormy Daniels' Lawyer Michael Avenatti Worked for Rahm Emanuel, Democratic Campaigns-Truth! - Truth or Fiction? Stormy Daniels' Lawyer Michael Avenatti Worked for Rahm Emanuel, Democratic Campaigns-Truth! Stormy Daniels’ Lawyer Michael Avenatti Worked for Rahm Emanuel, Democratic Campaigns-Truth! Adult film actress Story Daniels’ lawyer, Michael Avenatti, has worked for Rahm Emanuel and various Democratic campaigns over the years. It’s true that Michael Avenatti worked for a opposition research and media firm run by Rahm Emanuel while Avenatti was in college in law school. And, during that time, Avenatti has said he worked on 150-200 campaigns. Critics of Stormy Daniels’s case against the president argue that Avenatti’s history proves that he’s a partisan. Avenatti, however, countered in a 60 Minutes interview that he’s not motivated by politics. “I haven’t done anything in politics in 20 years,” he said. The impact of Avenatti’s ties to Emanuel can be debated. 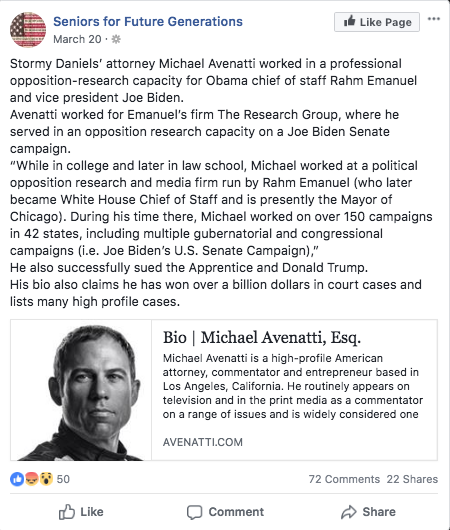 But it’s true that Avenatti worked for Emanuel and Democratic campaigns earlier in his career. Claims that Michael Avenatti worked for Rahm Emanuel and other Democrats while in college are true. Alabama Football Team Visits White House, Prays for Trump-Truth! Willie Nelson Falls Ill, Son Eddie Nelson Requests Prayers-Fiction! Do New Chicago City ID Cards Allow Undocumented Immigrants to Vote?